Alfred Sung will launch Always, a new "wedding-oriented" sparkling floral fragrance for women inspired by Grace Kelly, next month. Always was developed by perfumer Clement Gavarry; the notes include water lily, kumquat, neroli, pink peony, honeysuckle, orris absolute, sandalwood, patchouli and ambrette seeds. Ehh…I don’t think I’ll be needing any kumquat when I get married. That’s just me though. I just would rather not be associated with something orange and bumpy when I walk down the aisle. Call me old-fashioned. Ah, hope you will love the Kenzo Air! Recently tried the Kenzo Air Intense, did NOT like it! Haha yes the list of notes on that one made me apprehensive. I think I’ll take kumquats over that much cumin any day! Ooh, R, I had been a bit curious about the KenzoAir Intense — where did you snag your sample? A perfume angel? It seems hard to find, so just as well that it’s not wonderful (or at least not to you). Joe, Kevin bought a small bottle unsniffed (it’s pretty darned cheap) and sent me a sample. Too much cumin for me! LOL…it certainly wasn’t in perfume! Doesn’t sound very original, and the ‘kumquat’ is an effective-sounding marketing strategy…citrus is so much less exotic sounding. I will sniff this once available. I left something out…it will not go into widespread US distribution until the fall, although it will be on elizabetharden.com next month. Somehow kumquat doesn’t sound very appealing to me….sounds squishy. However, citrusy sounds very good to me today! I’m currently wearing PdN’s Cedrat Intense and LOVING it !!! Sparkly and upbeat! and that is so needed today with out gray, gloomy, rainy, wet, cold….did I metion gloomy (?) weather. In fact, I may go give myself an extra spritz or two of the Cedrat Intense….maybe the sun will emerge….sometime before JUNE!! that would be “our” gray gloomy weather….see? no preview button and you all are at the mercy of my bad bad bad typing skills! Trying hard to think if I’ve ever smelled kumquat in perfume — don’t know if I’d like it or not. Not to worry about the preview button. shhhh….but I never used it anyhow….but now I can blame my bad typing on NOT having it….so shhhh….can’t you see how this is better for my self esteem? For me they can double the kumquat and subtract the water lily, but then I am no Grace Kelly. LOL…I’m not much of a Grace Kelly either. If I want to feel like Grace Kelly, I wear Ormonde Jayne Frangipani. I actually think Kumquats sound kind of delicious. Tangy and sweet. Not to be too off-topic, but from what I’ve read Grace Kelly herself was no Grace Kelly. I’ve read the same, but man oh man, she sure looked the part, didn’t she? It would be really a drag to have to be “Grace Kelly” all the time, I’d imagine. Personally think sparkling is for prom, not weddings. Depends on how you interpret “sparkling”, I guess! I think of Ormonde Jayne as “sparkling” and it would be a perfect wedding scent. Actual glitter might be more prom-ish. This sounds like a really clean kind of powdery scent, probably clean patchouli to boot. I would be interested in what the bottle looks like in person though. Very nice lines. I’d like to see that bottle in person too…it isn’t an expensive scent, so might be one of those that looks better in pictures. Sounds Quite Fabulous! Am a big fan of Alfred Sung Fragrances (the Eponymous Fragrance is Incredibly Old-School Beautiful and a rare Fragrance to find, Encore, Is LUMINOUS! one of the best fragrances i have ever smelled!) and this Bottle looks absolutely Stunning. So clean and Simple and Pure, yet Expensive and Elegant! 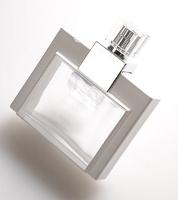 The notes don’t sound as SPARKLING as they may want it to be… Ambrette, Neroli, Orris Absolute? Sparkling is not what comes to mind when i hear those notes! But Love them all the same and Love Love Love Water Lily and Peony! Will be waiting for a Sniff! I liked one of the AS scents (the earlier ones are now all discontinued, I think) but can’t remember which. It was Shi or Sha — the one that smelled like lilac.